Gott Heart Art: Party On! Here's another project a little out of my realm. Pink and Brown, with lots of glitter on her dress, shoes, and in her hair. Pink jewels, pink fuzzy paper, pink velvety ribbon, wow, I'm on pink overload. 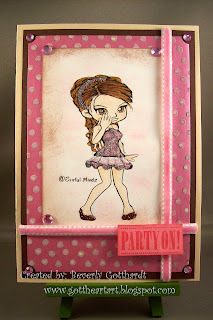 This is the free digi image: Ariana by: Beary Dust Stamps for the challenge at I Did It Creations. Supplies: Tan Card Blank 5 1/4" X 7 1/4" The Paper Company, Papers: Stampin Up-Whisper White, Chocolate Chip, Regal Rose, heidi grace designs-Shimmer flocked Paper, Stamps: digi image-Beary Dust Stamps, CTMH-B1332 Good Times, Inks: Stampin Up-Chocolate Chip, Regal Rose, Copic Markers, Doodlebug Design Sugar Coatings glitter, ribbon-Michael's, pink jewels unknown, Sakura Gelly Roll pen-clear star, Stampin Up-ticket punch, pop dots. This is the perfect girl card. LOve all of the glitter. What a fun touch to put it in her hair. Thanks for joining us at I Did It Creations. This is so cute! I love the little girl and how you used the sketch! Thanks for playing along with Black Leaf. such a sweet and fun card... the image is super cute too... thanks for joining us at BLS... see you around next week too..
Lovely card Beverly... Such a cute image, I love the girl... fun colors. You take on sketch is also great!! Thanks for joining us at BLS Sketch Saturday. Hope you join us again next week. I just love the glitter and also love how it worked with with the sketch. Thanks for joining us at Blackleaf Studios! love what you did, thanks for playing along with IDIC.